Kuo Nachi Taishaman is a Shinto shrine and part of the UNESCO-designated World Heritage Sacred Sites and Pilgrimage Routes in the Kii Mountain Range of Japan. The Kumano Kodō route connects it to other sites under the same classification, which are primarily located in Wakayama Prefecture, Japan. 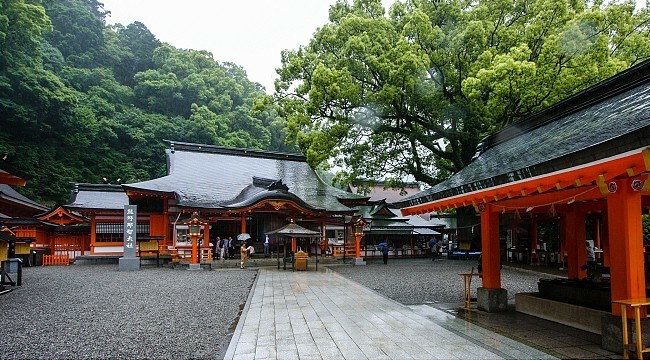 The four sites on the route, classified as pilgrimage destinations and World Heritage Sites, are: 1) Nachi Taisha; 2) Hongū Taisha; 3) Hayatama Taisha; 4) Koya-san. This classification is based mostly in Japanese history, as pilgrims would travel to all three sites to complete their pilgrimage. Kumano Nachi Taisha is an example of Buddhist and Shinto syncretism (Shinbutsu shūgō) nestled in the Kii Mountains, near Kii Katsuura, Japan. Cedar forests surround the site. The Nachi Waterfall, worshiped at Hiryū Shrine near Kumano Nachi Taisha is believed to be inhabited by a kami called Hiryū Gongen. Also, there is a sacred tree at this site, Sacred Camphor Tree, which located between the Nachi Shrine (heiden) and Seigantoji Temple. It is 850 years old and is said to have been planted by Taira-no-Shigemori(1138-1179). The straw rope (shimenawa) and paper flags show that this tree has been sanctified as a kami. The tree is alive with moss and ferns and other small plants growing on its ancient limbs. It is possible to enter the tree where there is a small altar for making offerings – inside the tree you feel as though you actually hear the beating of its 800-year-old heart! 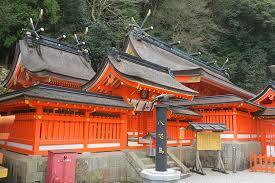 Nachi-no-Hi Matsuri Fire Festival, performed on July 14 is the major festival of Kumano Nachi Taisha. It is a fire festival in which 6 meters high portable shrines symbolically representing that the waterfall are purified with the fires from oversized torches laboriously carried by men dressed in white.